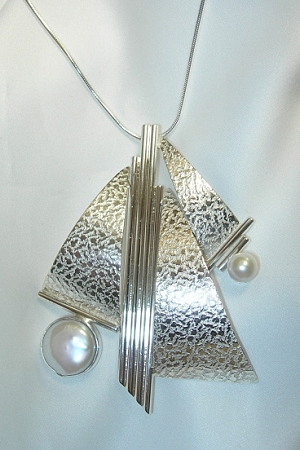 Art Deco Jewelry - This is a stunning bold sterling silver textured pendant that features two cultured freshwater white pearls, one coin pearl (13mm) and one round pearl (8mm). This One-of-a-Kind handcrafted necklace comes with an 18" snake chain. A stunning sterling silver necklace made of textured and shiny silver containing with two pearls - one round flat fresh water pearl, the other round cultured pearl. The pendant is on a sterling silver 18" snake chain. This is a unique piece of art that is signed by Aaron.